We all are sad over the tragedy surrounding the death of Madyson Middleton. Horrifying news from all over the world is so readily available to us that we sometimes become inured to violence or vow to give up listening to the news in order to block the pain. Thus it hits even harder when it's close to home and involves a child and a youth who were each part of a tight-knit community. Most of the time we watchful parents, teachers, policemen and citizens feel safe letting our children play outside. As they get older we give them more responsibility to go about on their own. A tragedy like this causes us to question and review our own practices. Adele Gardiner and Dan Hoppenfeld of Santa Cruz Children's School have suggested an article that may be helpful to parents of children who are aware of this almost inexplicable occurrence. We include the article in this newsletter. This may well be a good time to go to the woods, walk by the ocean, to experience the healing power of nature. When tragedy strikes, the results are traumatic both for those directly affected and for the community of people who know them or identify with them. Although we cannot control the fact that a tragedy has taken place, adults can do a great deal to help children regain their emotional safety. Thank you to Kidpower Teenpower Fullpower International and Irene van der Zande for permission to use this copyrighted article. Kidpower is a global nonprofit leader in providing safety education to prevent and stop bullying, violence, and abuse. For more resources, see kidpower.org or contact safety@kidpower.org. The Santa Cruz Police Department is giving away FREE gun locks to members of the community in an effort to increase safety. For those that choose to own a firearm, proper storage and safety of that weapon is of paramount importance! You can pick up a FREE gun lock and gun safety brochure at our lobby Monday through Thursday from 9:00 AM to 4:00 PM. We will give you as many as you need. 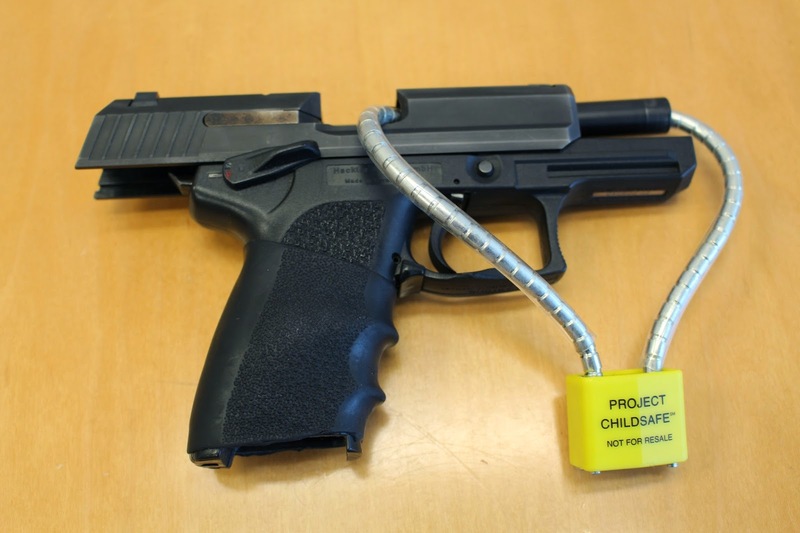 Gun locks can save lives. It is possible that tragedies could be avoided and accidents might not happen if a gun has a lock on it. If you own a firearm, respect it and secure it when it's not in use. The gun locks and brochures are provided in collaboration with Project Childsafe. For more information on the safe handling and storage of firearms, visit their website. In choosing to keep a firearm in your home, you are legally responsible for ensuring that the weapon is stored in a safe manner, and not easily accessible to children or other unauthorized individuals. The Santa Cruz Police Department supports the efforts of Project ChildSafe and firearm safety education. One of the Internet's less noble qualities is its ability to help people get up-in-arms about things that are non-issues. If you use Facebook or other social media, you're probably hit with it on a daily basis-forced hyperbole that translates to simple clickbait. This non-controversy rests on a treasure trove of examples how people misunderstand science, and how people with preformed agendas (e.g. "everything natural is good") misread scientific data to serve their own purposes. Travel from spectacular ridgelines, through old growth redwood forests, to sandy shores with our knowledgeable team of naturalists. Who better to lead you through our parks than California State Park professionals? Travel from spectacular ridgelines, through old growth redwood forests, to sandy shores with our knowledgeable team of naturalists. Imagine if the Santa Cruz Mountains could speak, and the stories they could tell. Our guides will share the secrets of this precious wilderness and give you a window into the lives of the people who lived here for thousands of years. There is no limit to the personal growth and amazing natural beauty you will experience on your backcountry adventure. For both trips, space is extremely limited. Sign up is on a first-come, first-served basis. Register by calling Cathryn Boult at Friends of Santa Cruz State Parks (831) 429-1840 or emailing cathryn@thatsmypark.org. For more detailed information please call (831) 335-6391 or (831) 427-2288 or visit www.thatsmypark.org. Route: You will begin at Jay Camp, Big Basin Redwoods State Park and travel along the Skyline to Sea Trail and arrive at Waddell Beach, 17 miles North of Santa Cruz on Hwy 1. This trip is approximately 13 miles long, with a net elevation change of 1,000 feet. We will be hiking no more than 8 miles per day. Families are welcome, but please no children under the age of 13. All children must be accompanied by a parent or legal guardian. Transportation: You will be required to organize your own transportation for both drop off and pick up. Route: You will begin at Castle Rock State Park and travel through the mountains, eventually arriving at Waddell Beach, 17 miles North of Santa Cruz on Hwy 1. This adventure is approximately 30 miles long with a net elevation change of 3,000 feet. We will be hiking no more than 10 miles per day. Families are welcome, but please no children under the age of 13. All children must be accompanied by a parent or legal guardian. Details: A unique craft pop-up event featuring local vendors who offer handcrafted products for babies and children! During upsetting times, kids are emotionally safest if they believe that their adults are calm and in charge. The negative impact on children will be greatly magnified if the adults around them sound anxious and as if their lives out of control. Parents, teachers, and other caring adults need to be aware of what kids overhear as well as what they are told directly. Remember that kids who seem oblivious are often absorbing information as adults talk on the phone, chat nearby, or listen to the car radio. Of course, in the face of a tragedy, adults often need support too. When we feel overwhelmed, it’s important to seek help from other adults away from children. When kids are around, they need their adults to act as if things are going to be okay even though something bad has happened. Media stories about tragic events can be compelling and cause us to believe that watching is doing something important and helpful. The problem is that exposure to terrifying images and horrifying stories is often unnecessarily traumatizing for adults and kids alike. Seeing upsetting situations on TV can feel as if it is still happening right now, even though the event is over. Unless you are in the midst of an emergency where you truly need minute-by-minute updates for your safety, turn off the radio, television, and Internet so that kids are not bombarded with this information. There is a difference between staying informed so we can take action if need be and becoming consumed with the need to know immediately in a way that becomes traumatic. Focus on reassurance and hope rather than going over the details again and again about what happened. Children are literal thinkers, so be careful when using words like “sick” or “problems”. We don’t want kids to worry that this will happen if their loved ones get sick, are hurt, or have problems. For tragedies that are dramatic but happen rarely, you can say, “This almost never happens. This is very scary and very sad. We are going to do our best to make sure that it doesn’t happen again.” Describe some of the things that are being done to ensure safety in your community, at your school, and in your family. Tragic events can bring up feelings of upset, worry, sadness, and anger for adults and children. However, it is not a child’s job to take care of adult feelings. Instead of being burdened with adult feelings, children need us to help them understand and work through their own feelings. Listen when kids talk, even if they say the same things over and over. Give reassuring answers to worried questions. If this is a child’s first experience with death, be prepared to explain what death is. Hospice has wonderful resources on how to talk with kids about this subject. Dealing with upsetting experiences is a process that can involve many feelings over a long time. Some children have difficulty talking about their feelings. Give kids alternative ways to express their feelings. They can write a letter, draw a picture, plant a flower, or help someone else. Many kids work out their feelings through play or stories. Sometimes children can feel so overwhelmed by their feelings that they shut them off. It’s normal for some kids to cope with an upsetting situation by pretending it’s not happening, but unresolved, suppressed feelings can lead to problems such as depression. If a child seems to be very shut down, getting professional advice is important. People grieve differently and at different times in different ways. Accepting children’s feelings means letting them know that it is okay to feel sad when they are sad, angry when they are angry, and happy when they are happy. Tragedies often leave people feeling helpless and out of control. Give kids opportunities to regain their sense of power and control by letting them make positive choices when possible. This can be as simple as deciding what to have for dinner or which game to play. Hug children as much as they want. Spend time with them. Tell them over and over that you love them and that you are going to do everything you can to keep everybody important to them as safe and healthy as possible. Rather than express their emotional discomfort in words, kids may complain of physical ailments like an upset tummy or a headache as their response to a crisis. This may be frustrating for family members but it is important to remember to be supportive and patient. Children and youth might regress into behavior they had when they were younger, such as bedwetting or being clingy. Some children may have increased anxiety, feel more sad, feel hopeless, and may become sensitive or irritable. If young people are moody, distracted or aggressive, help them control their behavior without shaming them. Seek professional help if your child seems unable to move forward without your support alone. The stress caused by a tragedy can increase irritability for adults too. Minor irritations can lead to major explosions. Even more than usual, young people might be hypersensitive to angry, upset behavior from their parents and other adult family members. Make sure that any anger looks in control rather than out-of-control. Try to resolve conflicts without becoming attacking. Remember that children and teens are learning more from what you do than from what you tell them. Show how to stay calm and respectful even when you feel upset. Use positive communication skills to work out disagreements. Get help with problems. Walk away from trouble. It is normal for adults to feel overwhelmed in the face of traumatic events. If adults have difficulty coping, they and their loved ones may benefit greatly from seeking guidance and emotional support from a mental health professional. Often extra counseling services are available through schools, emergency services, and places of worship during and after a tragedy. None of us want to have to deal with tragedy, but a great deal of learning can happen during hard times. Showing young people how to move through bad situation can create lessons for them that will help them for the rest of their lives. Ten days after my great-grandfather died, there was a holiday for children to celebrate the coming of spring after the bitter winter in that part of the world. My grandmother and her sisters and brothers thought that there would be no holiday for them that year because they were mourning for their father. They were astonished to see my great-grandmother coming out in the morning of that day with a huge tray carrying an assortment of every fruit she could find.